The Best Of Both Worlds Deal! 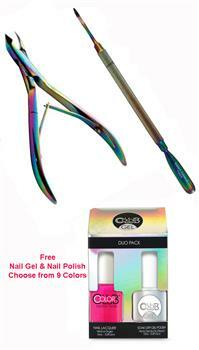 Titanium Cuticle Nipper & Pusher Plus FREE Color Club Duo Pack! Deal includes Titanium Cuticle Nipper 1/2" Jaw, Cuticle Pusher and Free Color Club Duo Pack. Choose from 9 Colors. Duo Pack includes one Soak-Off Gel Polish and one Nail Lacquer. Cures in 30 seconds with LED light technology or 2 minutes with UV technology.